Ah, the ethical dilemma of reluctant monsters the world over! Thoroughly oiled, the oily maniac also becomes really strong and pretty much invincible. He's like an extra greasy Incredible Hulk. He can leap really high, and knives and bullets cut through his oily self without leaving a scratch. If he does manage to accidentally get his arm or head cut off, he oily-ly grows back a new one, through the seeping, amorphous power of oil! Oil: So many unexplored uses in modern, prosthetic medicine! He's SO invincible, you start hoping that one of his victims will wise up and attack him with a giant bar of soap. Alas, that never happens. And if invincibility wasn't enough, he's also able to travel really quickly by turning into a slippery, sliding oil puddle (or oil slick, if he's at sea). He can go wherever oil can go, and he's pretty unstoppable. He can even flow through the city water system . . . dun, dun, dun, dun, DUN . . . into your tub! "Your father was a shaman; sort of exorcist." Geeze, that can't really be what the script says, can it? Also, the old guy has some kind of treasure map tattooed on his back, which has something to do with these magical oily powers. Treasure map, etched out in . . . dun, dun, dun, DUN . . . OIL! The Oily Maniac treasure map apparently tells our crippled hero to dig a big hole in the middle of his floor and sit in it. Witness the result. I should mention that this Shaw Brothers movie also tries to be some sort of weirdly sleazy romance. 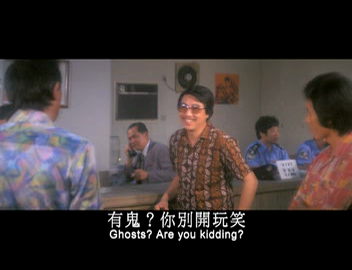 (Buyer beware: Many Shaw Brothers movies of the 1970s have a weirdly sleazy vibe to them.) Unfortunately, the hero of Oily Maniac gets the romance parts of this movie utterly and completely wrong. Tempting Fate: You should never say this in a horror film! What our hero lacks in romantic prowess, he makes up for in oily homicidal rage. There's a bunch of rather tedious and complicated plot strands in Oily Maniac, involving unscrupulous lawyers and unscrupulous doctors and unscrupulous business executives and unscrupulous rapists and unscrupulous financiers. You get the picture. Our oily, crippled, Jekyll-and-Hyde guy lives in a mean and seedy world, and the sole reason director Ho Meng Hua populated his movie this way is to give our hero lots and lots of victims he can kill while still retaining our sympathy. Bottom Line of this Chinese Movie Review: Cheesy, slow at times, and rather genre-confused. But hey, it's called Oily Maniac. What did you expect? If you are the kind of person who would even consider watching a 1970's movie called Oily Maniac in the first place, then sure: for you, it's recommended. 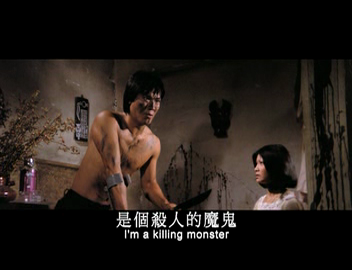 What I find hilarious in watching these Chinese movies is the way they translate them. Sometimes it will take you a minute to understand what they are talking about if you just rely on those subtitles. Yeah, I agree. The subtitles are half the fun!